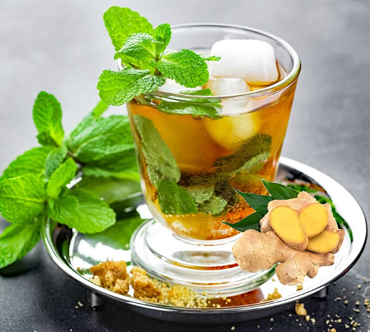 Ginger & mint green tea This tangy tea blend balances ginger with mint leaves to bring a vibrant, refreshing taste to a premium green tea base. Carefully crafted with the highest quality ingredients, ginger and peppermint, traditionally used to help support digestion, add intriguing flavour. Lemon juice can be added for an excellent natural cleansing effect while ginger and mint will also boost your immune system. Sit back and enjoy a cup of this spirited tea and refresh your well-being naturally.